For most every hunter I know, the trip of a lifetime would be going to Africa to hunt. A few years ago the Good Lord shined on me and I was afforded this unbelievable opportunity. The man I used to work for was Greg Pape, of Naperville, Ill. Over lunch, back in June of 2006 he said to me, "Mike, I want to go to Africa on safari. You set it up." That was my directive and, although a huge challenge, it was not unlike other such tasks Greg has given me. I knew full-well the kind of first-class trip Greg wanted, especially after he said he would be taking Erin, his wife. I did a massive amount of research in a very short amount of time. It was during this research that destiny became a very important part of this task. I pride myself on having an extremely effective network in the outdoor industry. Besides my Internet search, I sent e-mails to all of my outdoor contacts, to get their input, as well. Roger Lewis responded quickly and put me on the trail of INTREPID SAFARIS. That is all he could remember about the TV show he had seen from Africa, but he remembered that he was impressed. My first e-mail to Phillip DuPlesse got immediate response and a phone number. The odd thing was that I e-mailed South Africa and got an American phone number to call. I called the number and Phillip answered. It just so happened that he was in Texas, doing sport shows and promoting his business. Within 48-hours Phillip DuPlesse, South African Professional Hunter (PH) was having lunch with Greg and Erin in Naperville. I was there, too. More destiny. As lunch ended, Greg was booking his safari to South Africa to hunt a huge male lion. He and Phillip "clicked" from the start. They got on the same page very quickly. That is when I thought I heard Greg say, "Safari for three." I looked up from my salad with what must have been a deer-in-the-headlights look. "That's right," Greg said to me. "If I'm goin', you're goin'." Destiny. The story of Greg's hunt will come at a later date. Today I want to tell you of my safari...my hunt of a lifetime. Greg's quest for Africa's Big Five game species is admirable, but the "Plain's Game" animals are more to my liking. Since Marlin Perkins first brought Africa into our living rooms in the '60's, the massive Kudu has mesmerized me. The combination of body size and horn length made this majestic animal the subject of a young hunter's dreams. A never-attainable dream, for all practical purposes. In my conversations with Phillip, I also learned that a mature Kudu bull is one of the most elusive and difficult-to-hunt animals in Africa. They are big, but they are fast and do not take to human presence. They can disappear into the bush in the blink of an eye; much the way big bucks elude most of us each season. Phillip did garnish the tough news about Kudu with some encouraging news, as well. He said that in the 5 to 7-days it would take to get close to a big Kudu, I would have opportunities to see and take several other species. Let me tell you right now, he was not lying!! Greg finished his safari on a Thursday, which I filmed. On Friday afternoon, Phillip and I began my quest for the bull of my dreams. This quest started after Phillip introduced me to his wife, Anske, at the Intrepid Safaris camp. Words cannot describe the high level of comfort and the attention to detail that the DuPlesses' and their staff offer at their facility. To put into a comparison that we can all relate to, it was like going to the Four Seasons in the middle of the African wilderness. It is THAT good! The hunting style in Africa is totally different than that to which we are accustomed. Spot-and-stalk is the primary method. Hunting from blinds at waterholes is another. The spot-and-stalk method is Phillip's favorite. The spotting is done from a vehicle and then the stalk is often done on foot. However, if the right animal presents itself, you may be required to make your shot from the shooting rest atop the truck. The bush is thick and sometimes a road crossing shot is your only option. A couple of hours into our first day's hunt we came upon a large herd of Impala. There were over 40 animals in the group. Phillip is very picky about the trophies his hunters take. There is no such thing as "average" at Intrepid Safaris. As he glassed the herd through the thick brush, he spotted a big ram. "Get ready, Mike," he said with a heavy Afrikaner accent. "If that big male gets clear of the females, take him," he said. The first thing that crossed my mind was, "This guy must be nuts!" I could hardly find the animals in my scope through all that brush, much less pick a good shot. This was going to be tough. I had Africa pictured as wide-open savannahs and long easy shots. This shot was only 80-yards, but virtually impossible for this ole country boy. Just then several ewes turned to head toward the trail on which we were standing. Could I get this lucky the first day? "Be careful Mike," Phillip said. "Make sure it is the biggest male and then make a good shot," he added. It was right then that I asked myself, "What in the catfuzz are you doin' here?" There I was, in Africa, and a Professional Hunter had just told me pick only a big male of a species I had just seen for the first time in real life. Oh, I had looked at countless photos of the plains game over the past few weeks. But I am used to "quick-scoring" whitetailed bucks in the scope, not Impala. At least 20 females and a couple of young rams crossed the road in front of me at about 75-yards. Not a tough shot, right? That is what I was trying to tell myself when I heard Phillip whisper, "There he is. Take him when he steps out." I tried hard not to look at the Impala's horns as he stepped into the open. I tried, but I failed. I was so taken by this animal that I just stared through the scope. When the ram took a step I quickly realized that he was one more step from escaping. I steadied the crosshairs of my ALPIN OPTICS Apex scope on his front shoulder and gently squeezed the trigger of my THOMPSON/CENTER .30-caliber T/C Icon. The Impala hunched-up and jumped off the trail. Several more animals crossed behind him. I worked the bolt, reloading the Icon as Phillip moved quickly toward the spot of the hit. Twenty-yards off the road lay my first African animal, a trophy, 21-inch Impala ram. Needless to say, I was ecstatic. That first day was great, but no Kudu. On day two, I killed a jackal with the Icon at 120-yards. The jackal is South Africa's version of our coyote. It was fun, but still no Kudu. On day 3 we came across a small bunch of Gemsbok (Oryx) and I took a respectable old bull. I was tickled to death, sort of, because I had still not seen a Kudu. Not even a cow. That night at dinner, as Anske served Eland steaks with rice and salad, Phillip tried to encourage me. "Kudu are as hard as it gets. 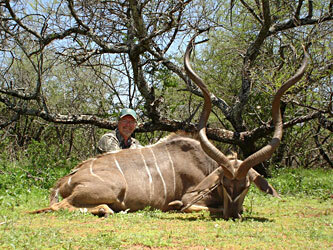 To take a trophy Kudu here is as tough as a Boone & Crockett whitetailed buck in the U.S. They don't just grow on trees, ya know?" Day number four was amazing. We saw hundreds more Impala. We saw Zebra, Wildebeest, Eland, Gemsbok, Red Hartebeest, Baboons, Water Buck, Steenbok and even some glimpses of Warthog. And to make the day even better, I finally saw some Kudu. Even though it was 7 cows and only a young bull, it was Kudu. But even with the Kudu stalk, the highlight of my day came in the last two hours as my young tracker, George, and I sat in a blind overlooking a water hole. I was hoping Kudu would come to quench their thirst after a very hot day on the Kalahari. No Kudu, but a pair of big Wildebeest bulls came to drink. I was in the process of getting some photography of them when a sound at the door of the blind got our attention. As George stepped toward the door, a big monkey jumped back as screamed. Well, the Wildebeest ran off, George had a mile seizure and I needed dry pants. But the best part came 30-minutes later when eight Giraffe, lead by a 15-foot tall bull came to drink. They spent several minutes 20-yards from us and a baby was among the herd. Once again, there I was, in my hunting blind, rifle in hand, watching Giraffes in Africa. Destiny. The next day was the final day of my hunt. Phillip was happy about the Kudu sighting and said that Daniel, his #1 tracker, saw big bull sign that day, too. We made a plan for the next day and I fell asleep among thoughts of long, twisting black horns. The very first animal we saw the next morning was a mature Kudu bull. I was ready to drop the hammer, but my PH said to pass. He estimated the bull to have about 45-inch horns. "Forty-five is plenty," I pleaded after the huge animal disappeared within 2 or 3 steps. "Patience," is all that Phillip said. It was my last day. I had checked my patience at the door. Two more sightings, two more successful stalks and still no shot. There was just too much brush. Then Phillip spotted another bull that was actually moving in our direction. "Let's see what he does," he suggested. The massive animal was moving slowly through the bush, browsing on the newly formed leaves of South Africa's early spring. When he stopped, he was only 50-yards out, but directly facing me, presenting no good shot. "Patience," is again all that Phillip said as he watched the animal though the tangled brush with his binoculars. As the bull fed he turned slightly, now quartering toward us. "Tell me what you see?" Phillip queried. "His left shoulder just opened-up. I have a shot," I replied with great anticipation. Phillip and I had discussed, at length, the devastating power of the 165-grain Hornady round made for the .30-T/C. We already decided that it was a totally sufficient round for anchoring shoulder shots. The entrance wounds on both the Impala and the Gemsbok resembled exit wounds of other cartridges I have used in the past. "Take him when you are comfortable," he said. The shot from the Icon penetrated the shoulder and blew-up both lungs. The bull was dead within 20-yards. As we approached the Kudu, cautiously, Phillip asked, "Did you see those horns in your scope?" I replied honestly, "No. There were just too many limbs. I had to take your word for it." I was not disappointed when I saw what I had shot. I was shocked. Not only was this the largest animal I have ever taken, somewhere around 700-pounds, but his horns were long and his rubbing had given them sharp, ivory tips. I was shocked. My Kudu measured 126 SCI inches. According to Phillip, it takes 121-inches to make the record book. Both Phillip and I were more than elated with this animal. He will make an awesome addition to my office/trophy room. There are so many people that I really need to thank that came together to make this trip possible. First of all, Greg Pape. Without his generosity, this trip would still be just a dream. Shaman Camouflage, Hornady and Thompson/Center Arms all played very important roles in the success of this safari. But I am most grateful for the expertise, hospitality and kindness showed to me by Phillip and Anske Du Plesse. 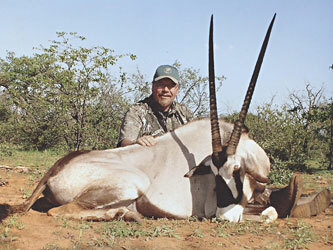 Their operation, INTREPID SAFARIS, is without doubt the finest hunting or photographic safari service in South Africa. Please contact them at www.IntrepidSafaris.com.